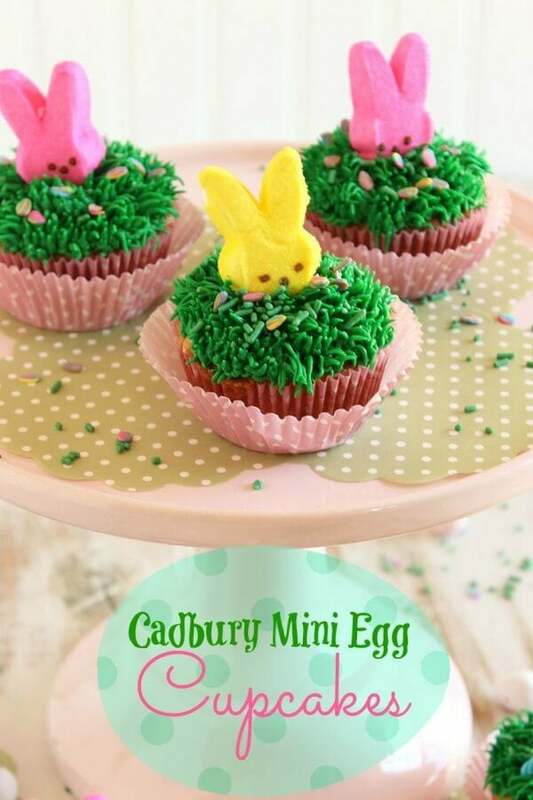 Say “Hello” to spring with these festive Cadbury Mini Egg Cupcakes! 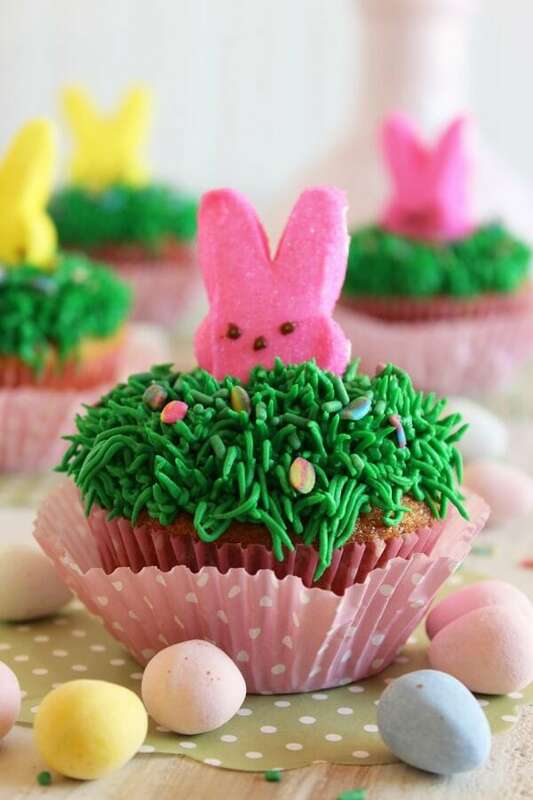 Decorated with a cute bunny peeking out of the grass, these easy to make cupcakes are the perfect Easter treat. Hi everyone! 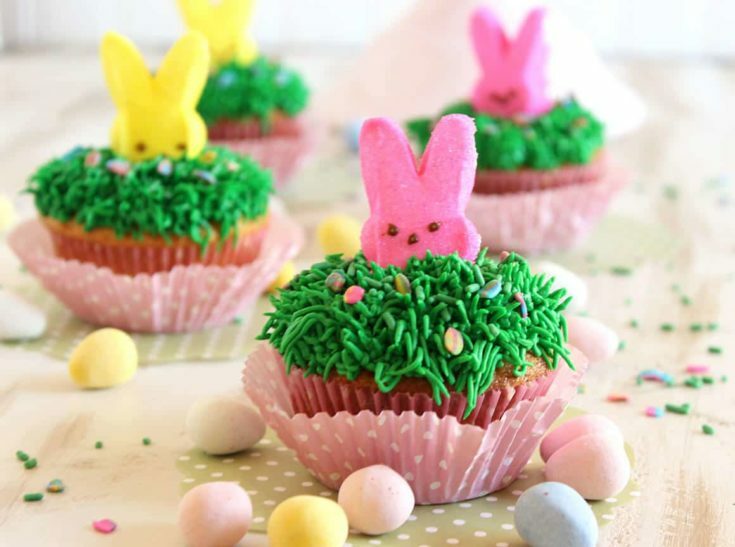 I’m Kellie from The Suburban Soapbox and today I’m visiting you all to share some thoughts on spring and these really cute cupcakes that are super simple to make. It’s been a long winter and I think we’re all ready for spring. While most people look for the first robin as the official sign of spring, I look for the pastel dishes and bunny decor at my local housewares store. It truly screams “Spring is HERE!” to me. As soon as the grocery store starts displaying the Easter candy, I bust out my shorts. Well, maybe a few weeks later but I know that spring has sprung….at least in the retail stores. 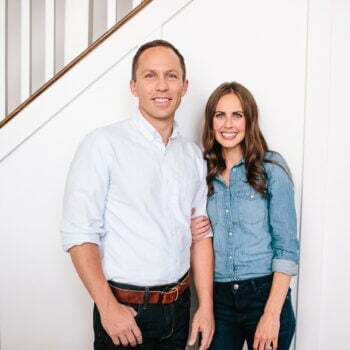 I never have a shortage of candy around my house this time of year either so I’m always looking for fun treats to share with my neighbors and my son’s preschool class. 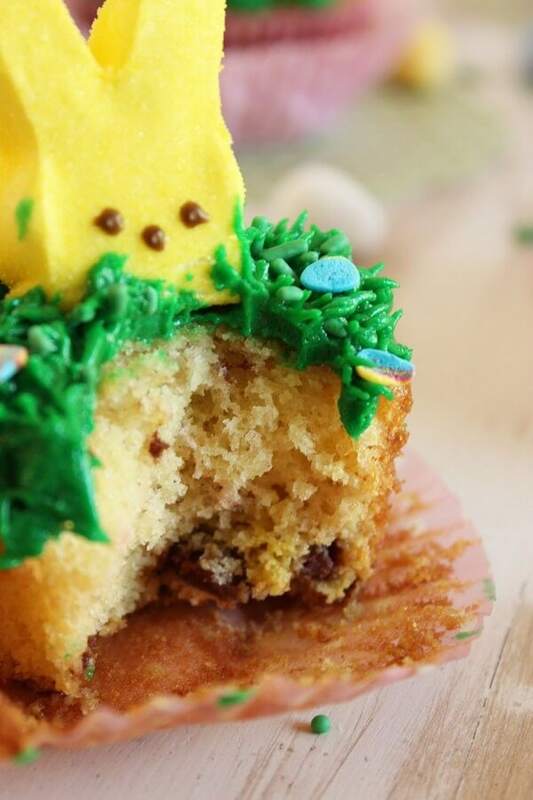 These Cadbury Mini Egg Cupcakes were so much fun to make and, you have to admit, they’re pretty darn cute. The cupcake itself is a buttery, moist vanilla cake studded with crushed Cadbury Mini Eggs. If you haven’t had a Cadbury Mini Egg you must fix that problem immediately. They’re the smoothest, creamiest of all the Easter candies I know and coated with a sweet, sugary candy shell. I could eat the whole giant bag in one sitting…which is one of the reasons I stuffed them into my cupcakes. And it was perfection….topped with a bunny. To decorate, you simply cut the head off a bunny Peep (it sounds a little harsh, I know, but you can make everything right in the world if you eat the rest because we don’t like to waste things…that’s what I did) and then pipe the buttercream “grass” all around the bunny using a Wilton #233 tip. Decorate with Easter egg sprinkles or just leave as is. My kids loved these and couldn’t wait to dig in. I just think they’re super cute and are now my NEW first sign of spring. 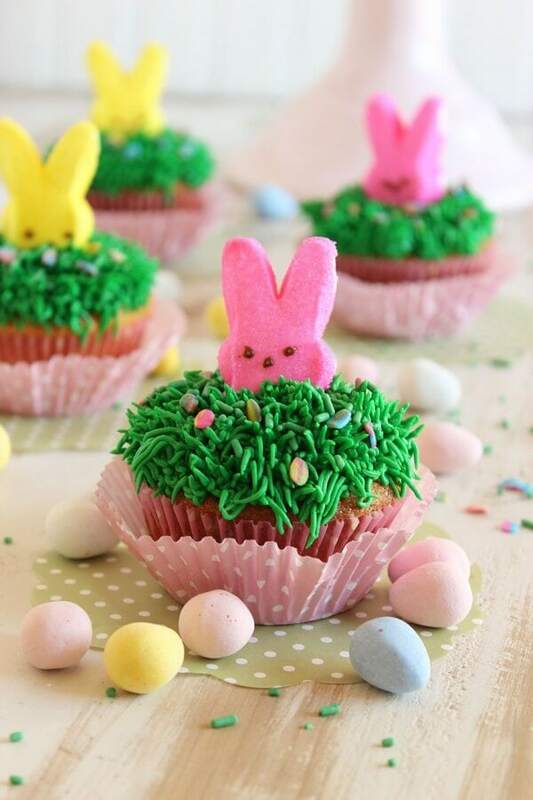 These would be fantastic on an Easter brunch table or for dessert after Easter dinner. Either way, I think they will definitely bring a smile to everyone’s face. 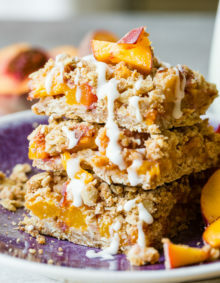 If you’re looking for more Easter brunch ideas, you can visit my blog at TheSuburbanSoapbox.com. 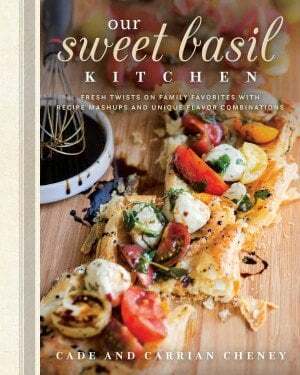 You can find great ideas for Easter brunch like Steakhouse Eggs Benedict or French Onion Quiche with Hash Brown Crust. Thank you so much, Carrian, for inviting me to hang out today. It’s been fun spreading SPRING around the web! In the bowl of a stand mixer, beat the butter and sugar with the paddle attachment until light and fluffy. While the butter and sugar are mixing, whisk together the flours, baking soda, baking powder and salt. With the mixer on low, add the eggs to the sugar/butter mixture one at time until completely incorporated. Slowly add the flour mixture until well mixed. Turn the mixer off and fold in the crushed candy. Line a cupcake tin with cupcake liners and fill each halfway with batter. 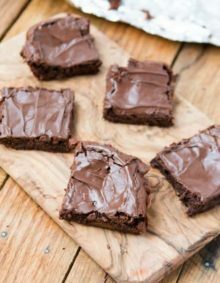 Bake in a 350 oven for 20-25 minutes or until a cake tester comes out clean. Allow to cool in the pan for 2-3 minutes and then transfer to a wire rack to cool completely. In the bowl of a stand mixer, beat the butter until light and creamy, slowly add 2 cups of confectioners’ sugar until well blended. Add the milk, vanilla and then slowly add the remaining sugar. Turn the mixer on med-high and beat until fluffy and white. Turn the mixer down low and stir in the food coloring until the desired color is achieved. Store in an airtight container for up to 2 days at room temperature. Cut the heads off the bunnies and discard the bodies. Pipe a small dot of frosting in the middle of the cupcake and gently press on bunny head onto the frosting. 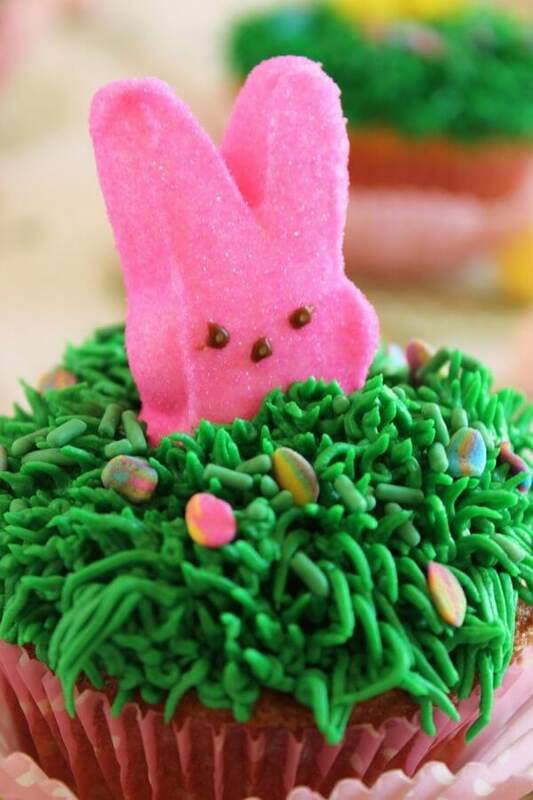 Using a “grass” tip, pipe the frosting all around the top of the cupcake to make it look as if the bunny is peaking out of tall grass. Repeat procedure until all the cupcakes are decorated. These are too cute!! 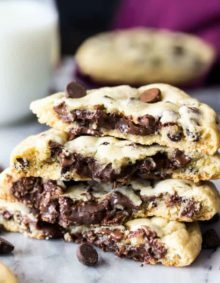 I have grandkids ages 2-14 and these are the perfect treats to send to school with all of them! Thank you so much for sharing this. Is it really 2 tablespoons of baking powder? I’m not a huge candy eater, but those Cadbury eggs are seriously, without a doubt, the most delicious candy ever created. When Easter comes around I always stock up! AMEN! I hardly ever, like ever have candy, but those come out and I become a hoarder of it! lol!!!!! Oh my gosh.I MISS YOU! !